The New Year is right around the corner, so how does bringing in the New Year with a Big Bang sound?!? 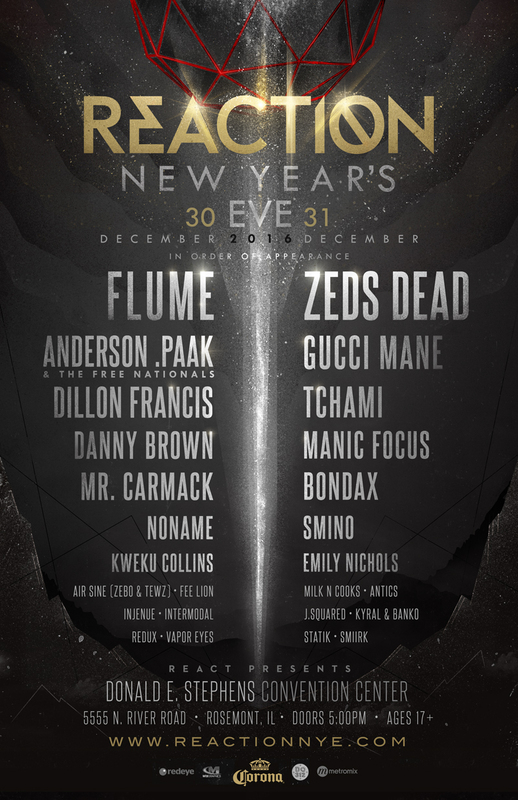 Journalist Without A Beat has partnered with React Presents to give one lucky reader a pair of 2-Day General Admission tickets to REACTION New Year’s Eve! The 2-Day epic holiday party hits the Donald E. Stephens Convention Center in Rosemont, IL on Friday December 30th & Saturday December 31st . Scheduled performances include some of the most hottest trending artists in music today – Flume, Gucci Mane, Zeds Dead, Anderson .Paak & The Free Nationals, Dillon Francis, Danny Brown, Noname and more! The fan-favorite, Silent Disco, will also be on hand. Check out the complete lineup below and get ready for REACTION NYE with the official Spotify Playlist! Must be 17+ to enter. Contest ends December 15th. Winner of contest will receive (1) pair of tickets/wristbands to REACTION New Year’s Eve on December 30th-31st. Tickets are not transferable and will need to be picked up by the winner with their photo I.D. in order to claim their tickets. Winner will be notified on the day contest ends. If said person doesn’t respond in a reasonable time, a new winner will be chosen.